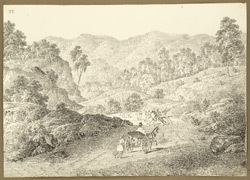 Pen and ink drawing by Sir Charles D'Oyly (1781-1845), of a view of the road through the rocky Chittru Pass between Gumia and Chittru Chatta in Bihar, from an Album of 80 drawings of views in Bengal and Bihar taken between January 1823 and May 1825. The largest group of drawings consists of sketches made between 26 January and 27 February 1823 during a journey from Calcutta to Gaya (Bihar) along the 'New Military Road'. This road passed through Manbhum district (Bihar) to Hazaribagh (Bihar) and through the hills to the N.W. to join the present Grand Trunk Road near Sherghati (Gaya district, Bihar). Begun in 1782, it had semaphore signalling towers built along it in the early years of the 19th century. This is the original sketch, later adapted, for plate 7 of 'Sketches of the New Road in a Journey from Calcutta to Gyah' (Calcutta, 1830). D'Oyly wrote, "The scenery of this pass is extremelt beautiful, the road now hid by deep descents, and now seen winding up the rising grounds beyond, when again it is lost in another declivity. Some of these descents are so steep as to require great caution in the conduct of the carriages going down them."